Post-rain, heart of the Midwest. My name is Peggy Wolff. I write, I cook, I bake, I’m a coffee snob, drink a lot of Rioja, channel Truffaut and Nicolas Ray and now that I stopped collecting menus, I grow things in the backyard. 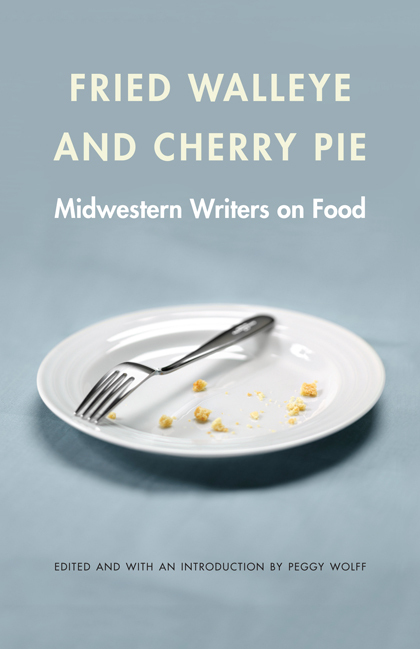 I started this blog to coincide with the release of my first book, Fried Walleye and Cherry Pie: Midwestern Writers on Food, an anthology of essays from highly regarded writers. Although the stories are about food, they are never just about food, but about Midwestern life. American life. Hola Peggy: Wow, what a blog. And what a beautiful cover on that new BooK!!! I am thrilled by what you’re doing. The blog form is such a good medium and your voice comes through so loud and clear—funny and intelligent and exactly IN PLACE. I think of how we all stumbled through together in that 1st Word of Mouth session. And I saw the fulfillment of what THAT form could be last year in Tepoztlan with a wonderful group of writers, 3 of whom are skilled bloggers like you where words and images come together but the voices keep their distinctively located individuality. As a teacher I get goose bumps. As a writer I’m envious that you’re at the beginning of the vast possibilities ahead. Hooray for you, Peggy. And I look forward to thumbing through that old-fashioned paper full of fish and pie. (Moved to Santa Barbara CA during Hurricane Sandy last Nov.I’m now in Julia’s last retirement home called Casa Dorinda. It’s a beaut. Hola Betty!! You should feel like the proud aunt who helped launch a book, & an author, and a steady contributor to the food section of the Chicago Tribune. Yup, all that, and against the backdrop of gorgeous Tepotzlan, My screen saver is a photo from that trip, so every single time I open my laptop, it is a reminder of that trip, and you. I do try for humor, and maybe that’s in the selection of story material? My latest ran in yesterday’s Trib: http://articles.chicagotribune.com/2013-08-28/features/ct-food-0828-brisket-slicer-20130828_1_brisket-northbrook-jewish-new-year. Since our daughter just moved to Berkeley to begin her animation studies, I will get out there…I will find you!